Ireland's Wild Atlantic Way - The Best of the West? From Cork right through to Donegal you'll see them—huge signs advertising the Wild Atlantic Way, Ireland's showcase scenic route and, maybe, the ultimate road trip you can have on the island. That is if you are in for a long drive and if you have time to spare. Because the Wild Atlantic Way is not to be done in a hurry and may be best tackled in shorter segments. Here's what you need to know. Ireland's Wild Atlantic Way is touted as the world's longest defined coastal touring route, and as being "inspiring, renewing, relaxing, and invigorating." At around 2,500 kilometers total distance covered it works out three times as long as California's Pacific Coast Highway. But while websites give you a driving time of 10 hours for the Pacific Coast Highway, my personal (realistic) estimate for doing the Wild Atlantic Way would be fifty hours pure driving time alone. At least. To compare on a European scale—about the same amount of kilometers will take you from Brussels to Moscow, in roughly half the time. While the Wild Atlantic Way was officially opened in 2014, this might be a bit misleading. Apart from erecting new signs, there was not a lot of work involved. It always was the best way to explore Ireland's west coast. So, basically, the Wild Atlantic Way is just an umbrella term for a (now signposted) way along the coast. Which takes in, according to Fáilte Ireland, "over 500 Visitor Attractions; more than 1,500 activities to pursue; 580 festivals and events throughout the year; 17 trails and 50 looped walks; 53 Blue Flag beaches; and 120 Golf Courses including some of the best links golf in the world." Obviously, if you want to take in anything from this list, you won't be done in 50 hours at all. Fifty days sounds more realistic. Where Does the Wild Atlantic Way Run? Now here's a conundrum—while you measure the circumference of a circle starting anywhere, a route going (essentially) from A to B needs to be started at A. Or at B, if you feel daring. We'd recommend doing the Wild Atlantic Way clockwise, starting in the South and working your way up North. This will keep you on the side of the road where the actual Atlantic is (with better views, especially for passengers), and you'll also have the sun at your back a lot of the time (saving you from squinting). Going in this direction, the Wild Atlantic Way starts at the Old Head of Kinsale in County Cork, where the Lusitania was sunk. Then the route winds its way along the coast, first going West. Mizen Head would be the next major landmark, after which the route turns North (very roughly speaking, in fact, it is very erratic). Dursey Island will be the next landmark, right at the tip of the Beara Peninsula, after that you'll drive part of the Ring of Kerry and right out to Bray Head. 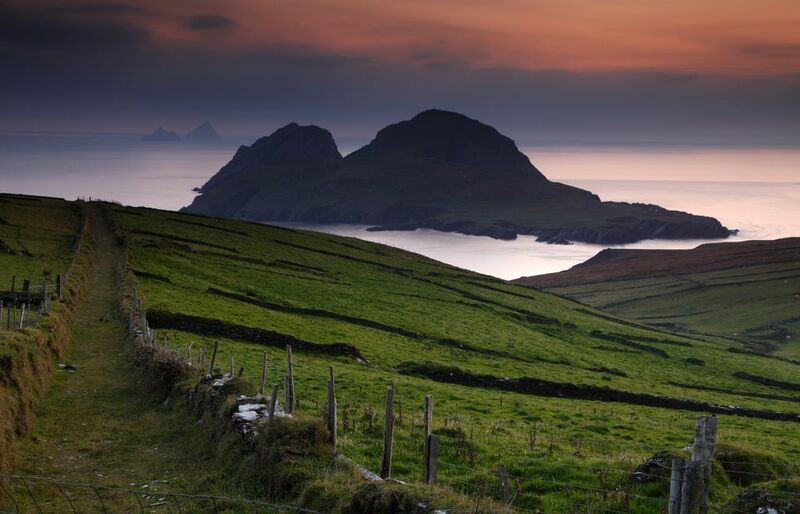 On the Dingle Peninsula, you will then gaze out at the Blasket Islands, before crossing the Shannon and continuing via Loop Head and the Cliffs of Moher. North of Galway the Derrigimlagh Bog and Killary Harbour are the next landmarks, then Keem Bay on Achill Island beckons. Here the Wild Atlantic Way tends to meander quite a bit, looping back on itself several times (get a map, because the signs won't necessarily help and might be out of kilter), finally arriving at Downpatrick Head on a route East that will bring you via Sligo to Mullaghmore Head. Soon you cross over into County Donegal, where the main landmarks of the Wild Atlantic Way are ​the gigantic cliffs at Slieve League, Fanad Head, and finally Ireland's northernmost point, Malin Head. You've done it, the Wild Atlantic Way is behind you. Bearing in mind that at each of the mentioned landmarks and towns it would be a good idea to spend a few hours, maybe the night, you might work out for yourself that you'll need at least two weeks to really explore the Wild Atlantic Way. Apart from the landmarks and town mentioned above, you will find something to look at virtually every minute. Unless you are so exhausted from driving that you have a thousand-yard stare straight ahead (never a good idea; twenty percent of all road deaths in Ireland are due to driver fatigue). So take breaks, and explore (and grab a coffee and some fresh air). The Wild Atlantic Way winds through no less than three Irish provinces (Munster, Connacht, and Ulster), or nine counties—Cork, Kerry, Limerick, Clare, Galway, Mayo, Sligo, Leitrim, and Donegal. If you cannot find anything interesting there, you must be lost. The "Wild Atlantic Way Passport"
To spice thing up a bit, the "Wild Atlantic Way Passport" was launched in 2016—a booklet which details the places you can go, and which has space for a postmark. Just drop in at any of the post offices listed in the passport, and staff will be happy to slap a stamp on it. Making "keeping track" a breeze, and also entitling you to free gifts along the way. While this ultimately is a gimmick, it certainly appeals to the "hunter and collector instinct" in all of us. And for ten Euros, not that expensive a souvenir. One additional bonus: visitors will head to the small local post offices and more than likely bring in business. As these are more than often in shops, buying a few essentials, from a Mars bar and a Coke to more substantial shopping. Good for the rural economy, and also a way to have a glimpse at real Irish life. Just expect the old dears having a good chinwag at the post office counter, be patient. Is the Wild Atlantic Way Worth the Hype? Yes and no—to be honest. Let's start with the points that deserve criticism—first and foremost that it is not a new route, just new signposts. That means that at times you have to use roads that were never designed for massive traffic and inexperienced drivers trying to avoid the hedges. Stories of epic encounters between mobile homes and farm machinery, leading to a lot of manoeuvering, some cursing, and traffic jams at the back of beyond are not unknown. And while tourists have used most of the route for ages, they are now channeled towards a single road, making congestion even easier. On the positive side, locals can now avoid the Wild Atlantic Way and the tourists going dead slow. One bit of slightly undeserved criticism was that the Wild Atlantic Way further commercializes the Irish west coast and that the hitherto quiet, idyllic, secret places are now overrun. Not true. Well, it certainly is commercial, but the whole area has been thriving almost exclusively on tourism for decades. Thus any initiative bringing in more tourists can only benefit the area. Often this criticism has been voiced by small tour operators, living on the mystique of the unexplored, hidden West of Ireland. Obviously marketing the same area as easily accessible worldwide kind of scratches at this shiny image. The positive side? Well, you have signposts guiding you onwards (never go without a map, though), and you will really see all the "must sees" on the Atlantic seaboard. While you will not be doing this in solitary splendor, you certainly will find the infrastructure to support your travels. Especially petrol stations—though it is a wise precaution to never let your tank go below half full. So yes, go ... while it might all be just a clever ruse to repackage old goods, it is well done, and it is well worth it. But my serious advice would be to either plan two or three weeks if you want to do the whole route or to pick a part that interests you and save the rest for later. If you really want to get away from it all, the further North you go, the less other drivers you'll meet. For comprehensive information and planning aids, visit the official Wild Atlantic Way website.